On the edges of the United States’ eastern Appalachian region sits an unlikely but fitting representation of traditional Indonesian keroncong (folk music). Hailing from Richmond, Virginia, the Rumput ensemble is a collective of diversely skilled musicians who came together to play the faraway sounds of Indonesian keroncong. Led by ethnomusicology student Hannah Standiford, Rumput aims to fuse the roots of Appalachian folk music with Indonesian keroncong, a combination that works well on paper but has rarely been tried. Having studied the art of keroncong herself, Standiford was able to fuse her love for Appalachian folk music and Americana with what she had learned from keroncong. As a result, her voice was able to match that of a traditional Indonesian keroncong singer and retain both the beauty of the song and her voice. Having studied keroncong music under the Darmasiswa scholarship in Yogyakarta in 2015, Standiford is currently conducting ethnomusicology research on traditional Indonesian music under a Fulbright scholarship in Surakarta, Central Java. The seven-piece Rumput band is now in the middle of a tour of Java, which is taking them from Jakarta to Semarang, Surabaya in East Java, Surakarta and Bandung in West Java. The performance itself at the @America center in Pacific Place Mall in South Jakarta was made up of several classic keroncong or regional tunes songs as “Jali-Jali” and “Yen Ing Tawang Ono Lintang” (If There Are Stars in the Sky), along with their main act of combining wayang (shadow puppet) inspired shadow puppetry with classic American folklore and themes. To do this, the ensemble brought their own “crankie” machine, which operated as a visual projection box fashioned by an illustrated scroll that is wound onto a spool and loaded into the box that serves as the viewing screen. The spool is then hand-cranked (hence the name) by an operator while the story is being told. Imagine it as a wayang screen but with scrolling, moving scenery. Jack and the Beanstalk, the classic American bedtime story, was the subject of the ensemble’s performance. 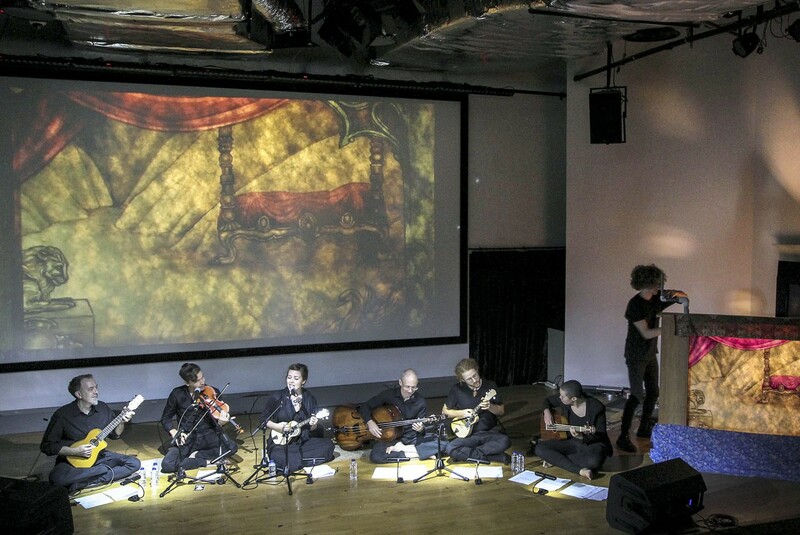 Delicately, the story was visually conveyed through shadow puppets, employing wayang-style movements and expressions through the brilliant illustrations of visual artist Beth Reid, all to the tune of the band’s original composition. It was folk music in its proper definition, as scenes mirroring what seems to be a classic Appalachian setting made up of dense, swampy woods and old, grand trees were serenaded by an interesting musical backdrop fusing bluegrass andkeroncong. In some ways, the sounds that make up both styles are similar and connected, but no one had thought of combining the folk music of two very different countries in order to emphasize that similarity. How did Rumput manage to do so? Standiford revealed that her first exposure to and interest in Indonesian traditional music was though her friend, Andrew McGraw, a fellow ethnomusicologist at the University of Richmond in Virginia. He was also part of the Rumput ensemble that night. McGraw had studied Balinese gamelan and founded a free community Gamelan ensemble named the Gamelan Raga Kusuma, which welcomed anyone who was interested in playing. Standiford also claimed that only two proper keroncong ensembles currently operate in the US, with Rumput being one of them and the other being the Orkes Pantai Barat based in the University of California, Riverside. “At least [keroncong] is represented on both sides of the States!” she said. In the US, Rumput plays mainly small house shows and in universities, mostly around their home town of Richmond. Sometimes, the ensemble gets to play at local bars, which is rather fascinating, considering that one would not really think to find the dulcet, meditative sounds of Indonesian keroncong gracing the atmosphere of a gritty American bar. “How cool is that, eh?” Standiford commented.